OKLAHOMA CITY (AP) Andrew Wiggins didn’t have time to get near the basket for a final shot. Just inside halfcourt was close enough. Wiggins’ desperation heave banked in as time expired to give the Minnesota Timberwolves a 115-113 victory over the Oklahoma City Thunder on Sunday night. Carmelo Anthony had hit a 3-pointer with about five seconds left to give the Thunder the lead. The Timberwolves were out of timeouts, so they had to scramble. Taj Gibson inbounded to Wiggins, who rushed up the court and got free with help from a crushing pick by Karl-Anthony Towns before pulling up for the winner. Gibson said the Timberwolves practice those kinds of plays regularly. Thunder forward Paul George got knocked down on Towns’ screen, and it freed up Wiggins. Wiggins scored 27 points and Towns had 27 points and 12 rebounds for Minnesota (2-1). Russell Westbrook scored 15 of his 31 points in the fourth quarter for the Thunder (1-2), who were coming off a loss at Utah on Saturday night. Anthony scored 23 points and Steven Adams had 17 points and 13 rebounds. Minnesota led 61-54 at halftime behind 13 points from Towns and 10 from Wiggins. Adams scored 14 points before the break. 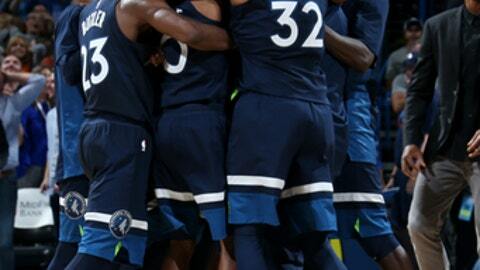 The Timberwolves fought off several bursts by the Thunder and led 88-75 at the end of the third quarter. The Thunder opened the fourth quarter with a five-point run that led to a Minnesota timeout. Oklahoma City continued the surge and got the crowd back into the game. A three-point play by Anthony cut Minnesota’s lead to 90-87 as Westbrook returned to the game from a rest. Adams converted a three-point play to cut Minnesota’s lead to 106-105 with 1:50 to go, and a 3-pointer by Westbrook tied the game at 110. Minnesota hung tough, and Wiggins bailed out the Timberwolves. Timberwolves: Gibson, who started for the Thunder at the end of last season, had 11 points and 10 rebounds. … Shot 57 percent in the first quarter to lead 28-23. … Minnesota beat Utah at home on Friday. … Jeff Teague scored 19 points and Jimmy Butler added 15. Thunder: Adams had eight points on 4-for-5 shooting in the first quarter. … Raymond Felton and Jerami Grant each scored 12 points. George has made just 23 of 62 shots this season. He scored 14 points on 6-for-20 shooting against the Timberwolves. Timberwolves: Host the Indiana Pacers on Tuesday. Thunder: George will play against the team he was traded from on Wednesday when the Thunder host the Indiana Pacers.